Fairmont Jasper Park Lodge began as a “Tent City,” associated with the Grand Trunk Pacific Railway. Situated in Alberta's magnificent Jasper National Park, a UNESCO World Heritage Site, the hotel opened in June 1922 with eight log cabins and the main building being billed as the largest single-story log structure in the world. Six films were shot on-site from 1930-1946 with distinguished Hollywood stars, including Bing Crosby, Jimmy Steward, and Marilyn Monroe. Crosby enjoyed the lodge’s golf course so much that he went on to win a tournament and had a cabin named after him. Fairmont Jasper Park Lodge has also hosted royalty, including both King George VI in 1939 and Queen Elizabeth II in 2005. The lodge has over 400 guestrooms and cabins that are tastefully decorated and filled with all the amenities anyone would need for an enjoyable stay. Bathrobes, plush towels, a mini refrigerator, Keurig coffee makers, and ceiling fans are just some of the comforts the lodge provides. The award-winning Fairmont Spa at Fairmont Jasper Park Lodge includes a state-of-the-art health club, a heated indoor swimming pool, sauna, and steam room. The 18-hole golf course, designed by renowned architect Stanley Thompson, was added to the hotel in 1923 and is a challenge laced by the natural beauty of the park. The lodge also boasts over 700 acres and 26,000 square feet of space for meetings, events, and weddings. There are several restaurants to appease any palate, including authentic Northern Italian, fresh sushi, and wild game and organic meats chophouse. Locally, there are a bevy of activities that will suit any guest. Whether guests seek winter or summer adventure, the possibilities are seemingly endless. Visit Whistler’s Mountain for stunning views of British Columbia, take a dip in the hottest natural pools in Canada at Miette Hot Springs, go whitewater rafting, view the Northern Lights, go horseback riding in the early morning, or visit Mount Edith Cavell for mountain biking and hiking. Visit downtown Jasper for restaurants, shopping, and museum tours. Take a romantic ride on the Rocky Mountaineer over two days through 600 miles of breathtaking scenery. There is never a dull moment in Jasper National Park. 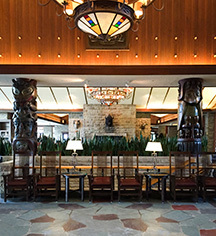 Fairmont Jasper Park Lodge, a member of Historic Hotels Worldwide since 2018, dates back to 1922. During the filming of The Emperor Waltz at the Fairmont Jasper Park Lodge, members of the staff were hired to keep Bing Crosby from sneaking off to go fishing or golfing instead of completing the movie. Adjoining Rooms: Adjoining rooms are available; $75 fee applies. ATM: An ATM is available on the Spa and Boutique level. Extra Person Fees: $30 per adult after three in the room, no fee for children. Hotel/Resort Fees & Taxes: 2% Destination Marketing fee, 4% room tourism Levy, 5% Room GST, $25 Resort fee + $1.25 GST + $1 Resort fee tourism levy per room per night. Parking: On-site parking is free; valet parking available (surcharge). Pet Policy: $50.00 CAD per pet, per day. Restrictions apply. Transportation: Transportation may be arranged through the concierge; rates apply. Fairmont Jasper Park Lodge began as a “Tent City,” associated with the Grand Trunk Pacific Railway. 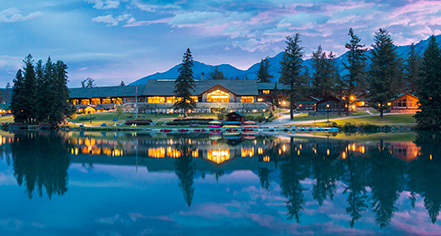 Situated in Alberta's magnificent Jasper National Park, a UNESCO World Heritage Site, the hotel opened in June 1922 with eight log cabins and the main building being billed as the largest single-story log structure in the world. Learn more about the History of Fairmont Jasper Park Lodge .